Betty Boothroyd, Baroness Boothroyd, OM, PC, Hon. FSLL (born 8 October 1929), is a British politician, who served as a Labour Member of Parliament (MP) for West Bromwich and West Bromwich West from 1973 to 2000. From 1992 to 2000, she served as Speaker of the House of Commons. She is the only woman to have served as Speaker. Following the death of Michael Martin in 2018, she is the only living former Speaker of the House of Commons. She sits, by tradition, as a Crossbench peer in the House of Lords. Boothroyd was born in Dewsbury, Yorkshire, in 1929, the only child of Ben Archibald Boothroyd (1886–1948) and his second wife Mary (née Butterfield, 1901–1982), both textile workers. She was educated at council schools and went on to study at Dewsbury College of Commerce and Art. From 1946 to 1954, she worked as a dancer, as a member of the Tiller Girls dancing troupe. During the mid to late 1950s, she worked as secretary to Labour MPs Barbara Castle and Geoffrey de Freitas. In 1960, she travelled to the United States to see the Kennedy campaign. She subsequently began work in Washington as a legislative assistant for an American Congressman, Silvio Conte, between 1960 and 1962. When she returned to London she continued her work as secretary and political assistant to various senior Labour politicians such as Under-Secretary of State for Foreign Affairs Harry Walston. In 1965, she was elected to a seat on Hammersmith Borough Council, in Gibbs Green ward, where she remained until 1968. Running for the Labour Party, Boothroyd contested several seats – Leicester South East in 1957, Peterborough in 1959, Nelson and Colne in 1968, and Rossendale in 1970 – before being elected Member of Parliament (MP) for West Bromwich in a by-election in 1973. In 1974, she was appointed an assistant Government Whip and she was a Member of the European Parliament (MEP) from 1975 to 1977. In 1979, she became a member of the Select Committee on Foreign Affairs, until 1981, and of the Speaker's Panel of Chairmen, until 1987. She was also a member of the Labour Party National Executive Committee (NEC) from 1981 to 1987 and the House of Commons Commission from 1983 to 1987. In 1987, she became a Deputy Speaker under the Speaker Bernard Weatherill. She served in this role for five years. In 1992 she was elected Speaker, being the first woman ever to hold the position. There was some debate as to whether or not Boothroyd should wear the traditional Speaker's wig upon her election. She chose not to but also stated that any subsequent Speakers would be free to choose to wear the wig. In 1993, the Government won a vote on the Social Chapter of the Maastricht Treaty due to her casting vote (exercised in accordance with Speaker Denison's rule). However, it was subsequently discovered that her casting vote was not required, as the votes had been miscounted and the Government had won by one vote. She was keen to get young people interested in politics, and in the 1990s made an appearance as a special guest on the BBC's Saturday morning children's programme Live & Kicking. On 12 July 2000, she announced in a statement to the House of Commons that she would resign as Speaker after the summer recess. Tony Blair, then Prime Minister, paid tribute to her as "something of a national institution". Blair's predecessor, John Major, described her as an "outstanding Speaker". She resigned as Speaker and as an MP by accepting an appointment to the position of Crown Steward and Bailiff of the Chiltern Hundreds on 23 October 2000. Boothroyd was awarded an Honorary Doctor of Civil Law (Hon DCL) by the City University London in 1993. Boothroyd was chancellor of the Open University from 1994 until October 2006, and has donated some of her personal papers to the University's archives. In March 1995, she also was awarded an honorary degree from the Open University as Doctor of the University (DUniv). Since 1999, she is an Honorary Fellow of St Hugh's College, Oxford. Two portraits of Boothroyd are part of the parliamentary art collection since 1994 and 1999. 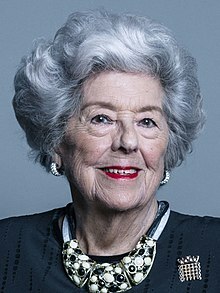 On 15 January 2001, she was created a life peer, the first of the millennium, taking as her title Baroness Boothroyd, of Sandwell in the County of West Midlands, and her autobiography was published in the same year. In April 2005, she was appointed to the Order of Merit (OM), an honour in the personal gift of the Queen. Boothroyd is an Honorary Fellow of the Society of Light and Lighting (Hon. FSLL) since 2009, and she is an Honorary Fellow of St Edmund's College, Cambridge. Boothroyd is furthermore a Vice President of the Industry and Parliament Trust and the Patron of the Jo Richardson Community School in Dagenham, East London, England, as well as being President of NBFA Assisting the Elderly. In January 2011, Boothroyd posited that Deputy Prime Minister Nick Clegg's plans for some members to the upper house to be directly elected could leave Britain in constitutional disarray: "It is wantonly destructive. It is destruction that hasn’t been thought through properly". Boothroyd said she was concerned that an elected Lords would rival the Commons, risking power-struggles between the two. Having never married or had children, Boothroyd has remained physically active, taking up paragliding while on holiday in Cyprus in her 60s. She has described the hobby as both "lovely and peaceful" and "exhilarating". Gules a representation of the mace of the Speaker of the House of Commons palewise or surmounted in base by a rose argent barbed and seeded proper over all on a fess gold an owl gardant proper between two millrinds sable. The mace is a symbol of Parliament, and thus represents Lady Boothroyd's role as Speaker of the House of Commons. The white rose represents Lady Boothroyd's home county of Yorkshire, while the owl represents her alma mater, Dewsbury Technical College. The millrinds refer to her constituency of West Bromwich because they symbolise the industrial revolution which is a dominant part of that area's history. Her motto can be explained in her own words: I only speak when I've got something to say, and when I've something to say, I'm trying to serve my country, and to serve the philosophy that I cherish very much. Boothroyd has received several honorary degrees in recognition of her political career. 6 December 1993: Doctor of Civil Law (DCL) from City, University of London. 1994: Doctor of Letters (D.Litt) from the University of Cambridge. 1995: Doctor of Civil Law (DCL) from the University of Oxford. 26 June 2003: Doctor of Laws (LL.D) from the University of St Andrews. ^ "Betty Boothroyd: To Parliament and beyond". BBC Online. 24 October 2001. Retrieved 21 January 2009. ^ "Baroness Boothroyd". UK Parliament Website. Parliament of the United Kingdom of Great Britain and Northern Ireland. Retrieved 19 February 2016. ^ Political Correspondent (9 November 1957). "Sir Victor Raikes Resigns Seat". The Times. ^ "Betty Boothroyd Autobiography Paperback – 3 Oct 2002 (synopsis)". Amazon.co.uk. Amazon. Retrieved 19 February 2016. ^ "EUROPEAN PARLIAMENT (MEMBERSHIP) (Hansard, 1 July 1975)". hansard.millbanksystems.com. Retrieved 13 January 2017. ^ "EUROPEAN PARLIAMENT (MEMBERSHIP) (Hansard, 1 March 1977)". hansard.millbanksystems.com. Retrieved 13 January 2017. ^ "Boothroyd praised as 'national institution'". BBC News. 12 July 2000. Retrieved 19 November 2013. ^ "No. 56014". The London Gazette. 31 October 2000. p. 12206. ^ Art in Parliament: THE RT. HON BETTY BOOTHROYD CHOSEN SPEAKER IN THE YEAR 1992; parliament.uk; accessed 21 March 2014. ^ "Artwork - Baroness Boothroyd". UK Parliament. Retrieved 29 July 2017. ^ "No. 56095". The London Gazette. 19 January 2001. p. 719. ^ "No. 57645". The London Gazette. 20 May 2005. p. 6631. ^ "Betty Boothroyd attacks Nick Clegg's 'destructive' Lords reform". Retrieved 29 July 2017. ^ 2 Kidd, Charles; Shaw, Christine, eds. (2008). Debrett's Peerage & Baronetage (145 ed.). p. 150. ISBN 978-1870520805. ^ "House of Commons Speaker's Residence". C-SPAN. Retrieved 15 February 2019. ^ "Lords fail to find house room for Lady Boothroyd's crest". The Daily Telegraph. Retrieved 15 February 2019. ^ "Honorary graduates chronological". City, University of London. Retrieved 29 July 2017. ^ "Selected Honorands". 22 February 2013. Retrieved 29 July 2017. ^ "Honorary degrees". 21 July 1995. Retrieved 29 July 2017. ^ "2003 - Betty Boothroyd to be awarded honorary degree - University of St Andrews". www.st-andrews.ac.uk. Archived from the original on 3 October 2015. Retrieved 29 July 2017.